There's a blizzard in Chicago. Winds gusting up to 60. The headline on Mike Hamernik's Chicago Weather Center blog is, "Blizzard continues to rage, drifts may reach 6 to 8 feet later tonight." 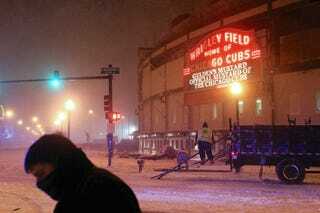 The streets near Wrigley Field are closed because of Wrigley Field, says the Chicago Sun Times. A panel of the Wrigley Field roof above the press box was damaged by extreme winds accompanying the blizzard, Cubs spokesman Peter Chase said. Part of the panel, made of fiber board, broke away, and the Cubs are working with the city to monitor the situation and to ensure there aren't any public safety issues, Chase said Tuesday night. Wonder if they'd let the Bears play. UPDATE: Here's a live cam. Of the stadium.